07.00 Leave to Kithulgala through Avissawella. 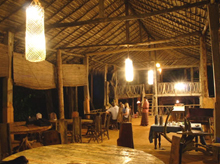 10.00 Arrive in Kithulgala Adventure park and Welcome drink will be served. 11.30 River bathing and at Leisure. 13.00 Buffet Lunch at the Camp site and afternoon at leisure by the riverside. 19.00 BBQ Dinner & Camp Fire with live music. Overnight stay at the Camp site. 07.00 Morning Tea & Buffet Breakfast at the Camp. 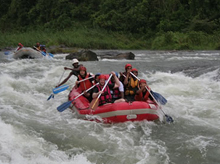 08.30 Water Rafting for 90 minuets. ( Confident Jumps / Nature Trek / Stream Slides ) optional. 12.30 Buffet lunch at the Camp site. After Lunch at Leisure by the riverside. 17.00 Check-out from the Camp site and commence the journey back to Colombo. Transport in A/C vehicle accompanied by English speaking Driver/Guide. Price Excludes :Cost of Extra meals. Tips for Hotel & Driver/Guide. JUL Travels (Pvt) Ltd Terms & Conditions apply.